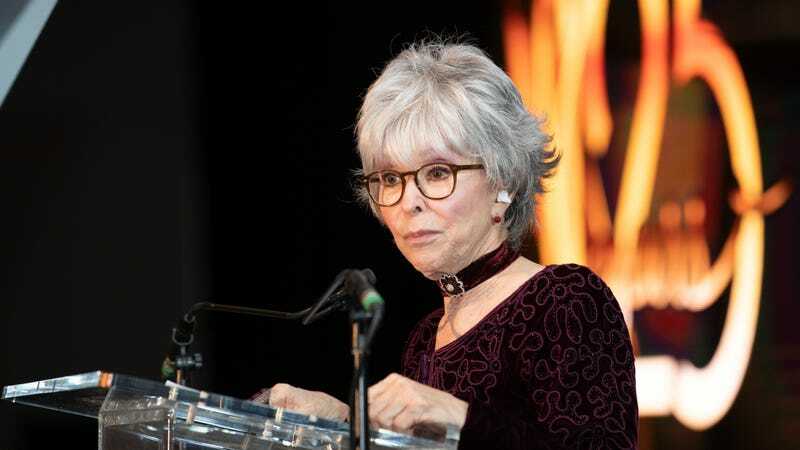 Rita Moreno’s insatiable (but also extremely justified) ability to hoover up all of Hollywood’s most prestigious honors continues this week, as Deadline reports that the EGOT-winner has signed on for a role in Steven Spielberg’s upcoming West Side Story remake. Moreno—who won a Best Supporting Actress Oscar for Robert Wise and Jerome Robbins’ 1961 adaptation of the Broadway hit—will play a new(ish) character in Spielberg’s version: Valentina, an expanded version of Doc, the character who runs the neighborhood corner store in the original script. Given the level of prestige talent now associated with the picture, can the venerable EGOOT be far behind? The One Day At A Time star responded to the news in a typically enthusiastic and delightful way, noting that, “Never in my wildest dreams did I see myself revisiting this seminal work. And to be asked by Steven Spielberg to participate is simply thrilling! Then to work together with the brilliant playwright, Tony Kushner—what a glorious stew! I am tingling!” Moreno will also serve as an executive producer on said glorious stew.